The Low Impact Development Stormwater Management Planning and Design Guide is an initiative of Toronto and Region Conservation Authority, Credit Valley Conservation, and Lake Simcoe Region Conservation Authority and has been developed in consultation with representatives from federal and provincial ministry, municipal and industry stakeholders. 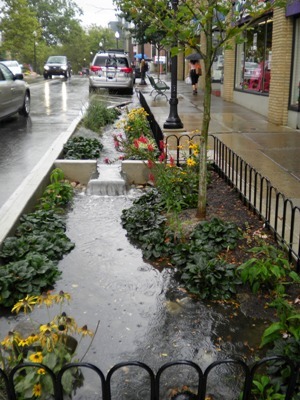 When the Low Impact Development Stormwater Management Planning and Design Guide was first published in 2010, it was the most comprehensive guidance document of its kind in Canada and quickly became the primary resource used by stormwater practitioners in Ontario. Implementation of low impact development (LID) or green stormwater practices and management systems has grown rapidly over the past ten years through supportive local policies and grant programs, numerous demonstrations, effectiveness evaluations and research projects. Experiences gained locally and around the world have provided many insights on how to make designs most effective from both treatment performance and life cycle cost perspectives, with an exponential growth in government, academic and industry literature. Furthermore, the Ontario Ministry of Environment Conservation and Parks are developing updated stormwater management criteria regarding runoff volume control and consideration of climate change, which will accelerate the integration of LID/green stormwater practices into management systems across the province. To address these information needs STEP has undertaken a comprehensive review and update of guidance provided in the 2010 Guide. Through the process we have transformed and expanded it into a wiki website – wiki.sustainabletechnologies.ca – to provide a new digital resource for sustainable stormwater planning and design that is well-suited to an era of innovation and rapid evolution. An important advantage of a wiki format lies in its ability to be easily updated, modified and enhanced as new information becomes available and based on feedback from users, thereby fostering continuous improvement. We encourage you to use the wiki as your primary resource for LID planning and design guidance from now on, but if you are looking for links to the unedited 2010 Guide documents, they are provided on this page for your reference as well.